Now, thanks to the new Humidor Pack, Camels, wherever you find them, are always fresh and in perfect mild condition. Factory-fresh Camels are air-sealed in the new Sanitary Package which keeps the dust and germs out, and keeps the flavor in. No harsh, dried tobacco to burn the throat. No peppery dust to sting delicate membrane — just the cool mild aroma of fine tobacco, properly conditioned. 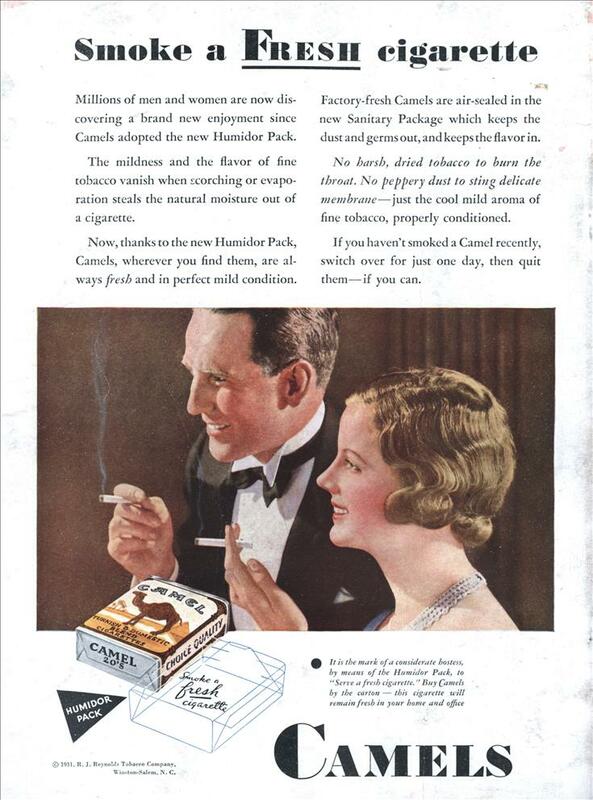 It is the mark of a considerate hostess, by means of the Humidor Pack, to “Serve afresh cigarette.” Buy Camels by the carton — this cigarette will remain fresh in your home and office. “If you haven’t smoked a Camel recently, switch over for just one day, then quit them — if you can.” I hear they use the same approach for crack.